Chutneys are the most popular Indian condiments. Coconut Chutney is a well known accompaniment with Idlis and Dosas. This dry Lasani chutney is most loved with Vada Pav - Indian vegan burger. We relish this chutney more often with parathas and dosas too. Dry roast red chillies, sesame seeds, peanuts and coconut, each one separately. Roast at low flame until you get a toasted aroma and color changes slightly. Let all the roasted ingredients cool. Wipe the blender/mixer jar dry. Blend/Grind all the roasted ingredients, salt, tamarind, peeled garlic and salt to a fine powder. Keep it refrigerated, since raw garlic is used for this chutney. 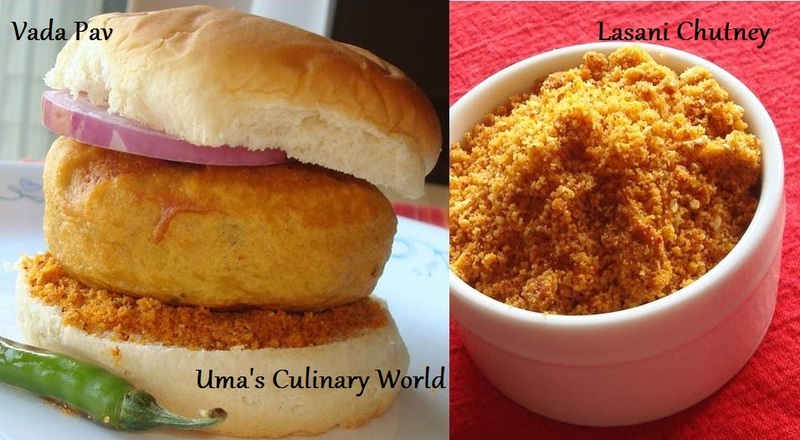 Enjoy this Dry Lasani Chutney with the famous Vada Pav or North Indian Parathe or Idli Dosa. You can relish this chutney with curds/yogurt as well. Some like it with a dollop of ghee/clarified butter. love this chuteny with vada pav. looks perfect. nice pics uma. chutney looks great. Omg, wat a flavourful chutney,just loving it.